Both of Ireland’s swimmers in action tonight at the Paralympic Swimming World Championships in Glasgow finished sixth in their respective finals. 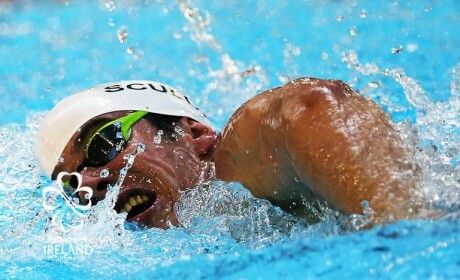 London 2012 Paralympian James Scully produced another season’s best performance in the final of the S5 200m Freestyle to finish in sixth place in a time of 2:53.77. Qualifying seventh fastest for the final the National Aquatic Centre (NAC) club swimmer will be pleased to have improved that placing in the final and swam his fastest time of the year. The S5 class is incredibly competitive and dominated by a leading quartet of reigning Paralympic and world champion Brazilian Daniel Dias, European champion Andrew Mullen of Great Britain, American Roy Perkins and Spaniard Sebastian Rodriguez. As expected Dias blew the race apart storming to gold fractionally outside of world record time in 2:27.28 ahead of Mullen in second (2:41.35) and Perkins in third (2:45.41). In the last race of the day Laois teenager Nicole Turner swam just off the huge new lifetime best she set in the morning heats when placing sixth in the S6 50m Butterfly final in 40.63. This was Turner’s third final in as many days and her sixth race in total at this her first ever senior championships. Reigning Paralympic champion and world record holder Oskana Khrul of Ukraine took gold in a time of 37.33, with Tiffany Thomas Kane second in 38.17, with Dong Lu of China taking bronze in 38.46. Four of the six strong Irish team are in action tomorrow. Dublin teenager Ailbhe Kelly makes her debut at a World Championships when she races in the heats of the Women’s 100m Freestyle (S8) at 10.46am. Ellen Keane, Darragh McDonald and Nicole Turner are all in 50m Freestyle action in their respective classes after that, none of whom would see it as their main event but nonetheless will be keen to race well.